February 15, 2019: Necromancer Returns! Another success for the ongoing Pocket Box campaign on Kickstarter! 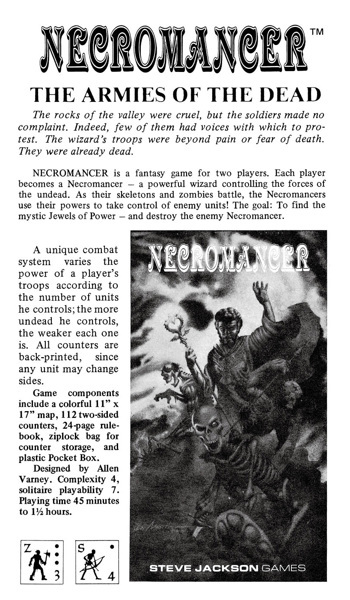 Allen Varney's Necromancer, first published in Space Gamer magazine and then produced as a plastic Pocket Box game, has been unlocked and added to the Kickstarter project, making it one more long-lost classic that is coming back to tables everywhere this fall. "NECROMANCER is a fantasy game for two players. Each player becomes a Necromancer – a powerful wizard controlling the forces of the undead. As the skeletons and zombies battle, the Necromancers use their powers to take control of enemy units! The goal: To find the mystic Jewels of Power – and destroy the enemy Necromancer." In addition to being suitable for two, Necromancer is also rated as a 7 on the Steve Jackson Games solitaire playability meter (see this Daily Illuminator post for more info). Regardless of how you approach the game – either against an opponent or as entertainment for a solitary evening – Necromancer is a fantastic addition to the ongoing Pocket Box campaign on Kickstarter. Please check out the project and join us today; we're now two weeks from the project's closing date.